I was feeling somewhat anxious as I stepped off the shuttle bus that gray January day. My lightweight jacket did little to protect me from the damp chill that permeated the atmosphere. The bus I had boarded just a few minutes before made a run each weekday taking college students from East Texas State Teachers College to and from Commerce High School. I was enrolled in an education course required for those of us earning a teaching certificate. We were required to observe a certain number of classes at the high school. That day in my junior year would be my first experience as an observer. I would be arriving after the last class period of the day had already begun. It was forty-nine years before Homeland Security legislation; I was not even required to register at the principal's office as a visitor. I had been given a room number, and it was my responsibility to find the room on the first floor where Miss Tula Milford was conducting a ninth-grade English class. I entered the room with trepidation and took a seat near the door, which was located at the back of the room. 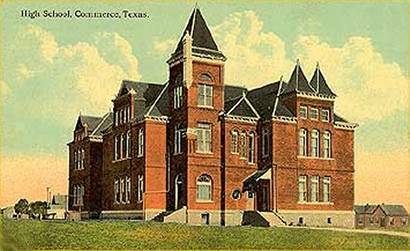 When I enrolled at East Texas State Teachers College two years before, I was considering journalism as a major. In our rural community my only previous contact with a reporter was with a neighbor who submitted a column to the Hopkins County Echo, a weekly published in Sulphur Springs. Her report consisted of references to out-of-town visitors who attended funeral services and other items of local interest. Occasionally a student from the high school would give her a list of the names of the officers elected by a certain class for that year. This information would appear in the following issue of the Echo. My parents, who had no formal education, expected me to earn a teacher's certificate. Almost all the people my parents knew who had gone to college had become teachers in public elementary or secondary schools. Exceptions were the Sparks brothers, who earned Ph.D.'s and taught college classes-- one in history at Texas Woman's University, the other in English at Duke. These brothers were considered so eccentric by the people of the community that they were hardly role models. For my parents, the concept that anyone who grew up in Saltillo, where I graduated from high school, would or could become an attorney, a medical doctor, or a dentist was remote. Besides, no one had the money to finance a student in the schools that educated professionals. Because of their expectations, I never told my parents that I was considering a major in journalism. They would never have related to my glamorized idea of news gathering and reporting, which was based primarily on radio drama and the movies. Although in my sophomore year I began to follow the curriculum required for teacher certification, I still was not convinced that I wanted to become a teacher. As a junior, I found myself on the teacher-certification track, preparing to observe classes at the only high school in Commerce. The nervousness I had experienced earlier that morning began to subside once I took a seat in Miss Milford's classroom. Neither she nor the students appeared to notice that I had entered. Tula Milford was a woman in her early sixties. She wore rimmed glasses, and her gray hair, which appeared to be rather long, was pulled into a bun. She wore a gray dress with a broad white collar. When I entered the room, she was sitting behind her desk. Because her glance never met mine, I assumed that she was accustomed to observers entering the room after she had begun class. Except for the sound of Miss Milford's voice and the soft, intermittent hissing sound of the steam radiators, the room was quiet. It felt comfortably warm in contrast to the chill I experienced immediately upon stepping off the bus. The windows of the classroom looked out on an enclosed space surfaced with asphalt. The red brick wall across appeared stark in its plainness; I soon realized, however, the business of that particular classroom did not depend on accouterments. Open before her was a textbook from which Miss Milford was reading Edwin Arlington Robinson's "Miniver Cheevy." When she finished reading the poem, she chuckled about the folly of Cheevy's wishing he had been born in another century. She pointed out the unappealing sounds of the first syllable of Cheevy's name and commented on the effort required to pronounce Miniver Cheevy as opposed to the relatively less effort required to pronounce a name like Allen, for example. Miss Milford pointed out that Robinson must have equated that difficulty with the difficulty Cheevy faced in coping with his life. These fourteen-year-olds were attentive while Miss Milford read "Richard Cory," a second poem by Edwin Arlington Robinson. One student questioned why a man with wealth and good looks would ever take his own life. Most of the students were attentive, and several participated in the discussion. In my mind, I contrasted the behavior of these students with the disruptive behavior of some of my former classmates just a few years before when I was in the ninth grade. After Miss Milford called a halt to the class discussion, she allowed the students to work independently on reading and writing assignments for the week. I observed that most of them opened notebooks and began to write. Others were reading library books. One by one, several of the students raised their hands. Miss Milford motioned for each to come to her desk at intervals. Each took a sheet of paper or a notebook with him/her. The class period ran its course in a most orderly fashion. As I noted the faded navy blue skirt of the girl seated across the aisle from me and the scuffed brown loafers of a boy in the desk in front of the girl, I experienced a feeling of appreciation for the concept of public education. I suspected the skirt the girl wore had belonged to an older sister or to a cousin and that the boy's loafers were the only pair of shoes he owned. Yet these students, whose parents probably paid less in school taxes than the majority of citizens in the state, had an opportunity to learn from a teacher as qualified and as dedicated as a teacher in a private school. The parents of these two students probably could not have afforded the tuition charged at a private school. I left Miss Milford's classroom that day with the feeling that I wanted to continue my pursuit of a teaching certificate. Perhaps, after all, I could find personal satisfaction as a classroom teacher. As I boarded the bus that would take me back to the campus, I realized that the goal of becoming a teacher was no longer influenced only by what my parents expected, but one that I myself was now engaged in.